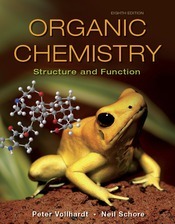 Organic Chemistry: Structure and Function 8e maintains the classic framework with a logical organization that an organic molecule’s structure will determine its function and strengthens a focus on helping students understand reactions, mechanisms, and synthetic analysis and their practical applications. The eighth edition presents a refined methodology, rooted in teaching expertise to promote student understanding and build problem solving skills. Paired with SaplingPlus, students will have access to an interactive and fully mobile ebook, interactive media features and well respected Sapling tutorial style problems—Where every problem emphasizes learning with hints, targeted feedback and detailed solutions as well as a unique pedagogically focused drawing tool. Expanded WHIP problem-solving strategy is included with solved exercises within each chapter, providing a guide for how students should approach problem solving: What How Information Proceed. NEW Guidelines highlight the steps that students will use to learn new materials and solve important problems. Worked Examples: Integrating the Concepts section at the end of every chapter includes a series of sample exercises with solutions of the chapter’s most important concepts. ChemCasts replicate the face-to-face experience of watching an instructor work a problem. Using a virtual whiteboard, the Organic ChemCast tutors show students the steps involved in solving key Worked Examples, while explaining the concepts along the way. The Worked Examples featured in the ChemCasts were chosen with the input of organic chemistry students. A wide range of end-of-chapter problems include Chapter Integration Problems with step-by-step, worked out solutions, Team Problems for collaborative learning, and Pre-Professional Problems in the style of the MCAT.